Merze Tate, a historian, political author, world traveler, and philanthropist, was the first African American to graduate from Oxford University. She was born during a terrible blizzard in rural Blanchard, Michigan on February 6, 1905 to Charles and Myrtle Tate, both farmers. Her grandparents were considered black pioneers when they took advantage of the Homestead Act of 1862, allowing them to move further west from Ohio to purchase land cheaply in the predominantly white Mecosta County in Michigan. Excelling in her studies, she won an oratorical contest at Battle Creek High School and graduated valedictorian at Blanchard High School. Tate received a scholarship to Western State Teachers College (now Western Michigan University) and became the first African American to graduate, earning a teaching diploma and bachelor’s degree with honors in 1927. Shortly thereafter, Tate taught at Crispus Attucks High School in Indianapolis, Indiana while studying for her master’s degree in history from Columbia University. After graduating in 1930, Alpha Kappa Alpha, a black sorority awarded her a scholarship that helped defray the costs of her studies at Oxford University in 1932. In 1935, Tate earned a bachelor of literature degree (B.Litt.) in international relations and became the first African American receive a degree at that institution. She returned home to study political science at Radcliffe College, the prestigious all-female school that later merged with Harvard University. 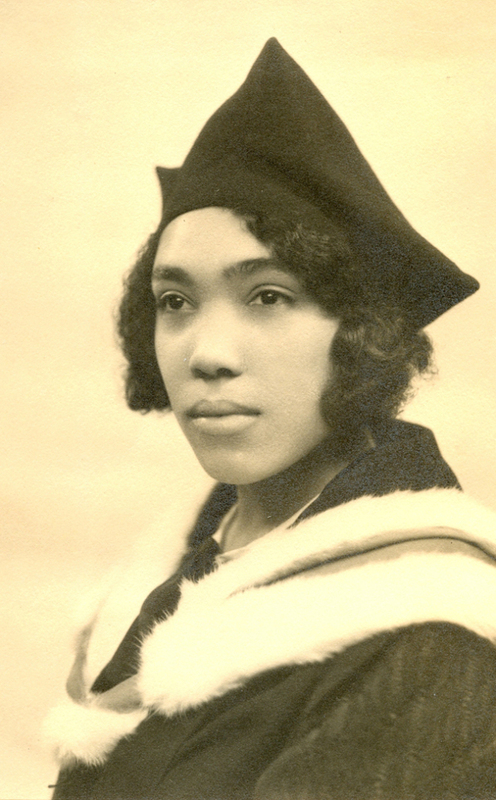 In 1941, she obtained her Ph.D. and was the first black woman to do so at Radcliffe. Since early childhood Tate dreamed of traveling the globe and exploring new places. As African Americans grappled with the economic crisis during the Great Depression, Tate traveled the world. Her status as a professional woman, having never married with no children, afforded her the luxury to tour six continents. While teaching high school, she established a student travel club. In the early 1930s, Tate, who was fluent in five languages, took German classes at the University of Berlin. After hearing Hitler speak and other harrowing events, she cut her stay short. In the 1950s, she was a Fulbright Scholar and lecturer for the U.S. Information Agency and visited India, Thailand, Japan, the Philippines, Hong Kong, and Singapore. Tate taught at several historically black colleges and was an administrator at Bennett College and Morgan State University before arriving at Howard University. She was hired as the first black woman historian in the history department and taught there for 35 years before retiring in 1977. As a sought-after international relations and diplomacy expert, she authored numerous scholarly articles books on the subject, including The Disarmament Illusion: The Movement for a Limitation of Armaments to 1907 (1942), The United States and Armaments (1948), and The United States and the Hawaiian Kingdom: A Political History (1965). Among her many achievements, she was a member of Phi Beta Kappa and was conferred several honorary degrees. On June 27, 1996, Merze Tate died of cardiac arrest at Providence Hospital in Washington, D.C. She was buried in a cemetery near her birthplace in Blanchard, Michigan. In 2014, her hometown dedicated the Tate Memorial Library in her honor. The Merze Tate Travel Club operates in Kalamazoo, Michigan, and Howard University benefits from the endowed annual Merze Tate Diplomatic History Seminar. Barbara Savage, “Professor Merze Tate,” in Toward an Intellectual History of Black Women (Chapel Hill: University of North Carolina Press, 2015); Sonya Bernard-Hollins, “Merze Tate,” https://characterclearinghouse.fsu.edu/article/merze-tate.